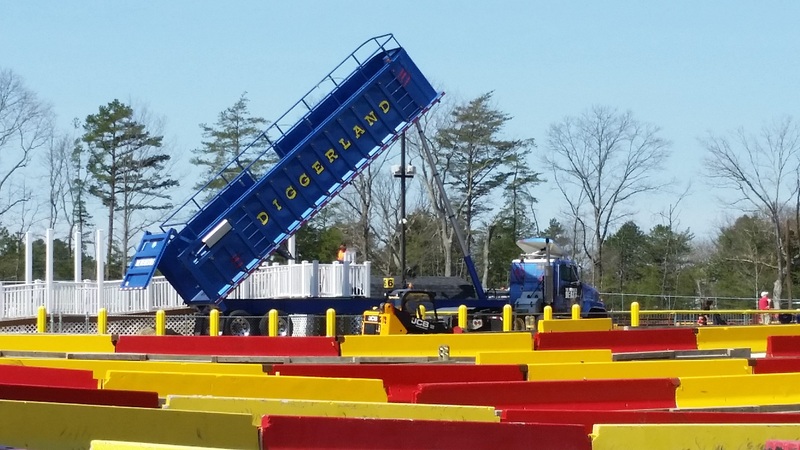 Thanks to Diggerland USA for hosting our visit! The fact that kids love trucks is no secret. This love is why “construction worker” is a popular Halloween costume and pretend-play prop, and why touch-a-truck events are so popular. What may be lesser-known, though not really a secret, is that there is a place where kids actually can operate and even drive real trucks. 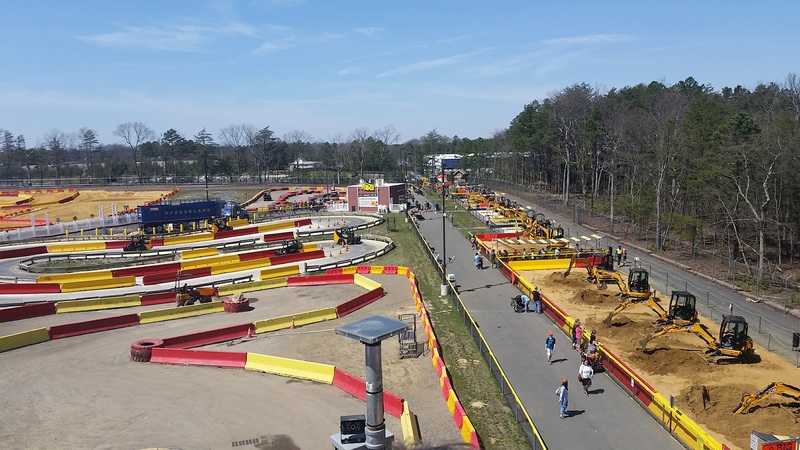 Diggerland USA in West Berlin, New Jersey (just three hours from the Washington, DC, area) is a fun construction-themed park that offers an adventure-filled day. 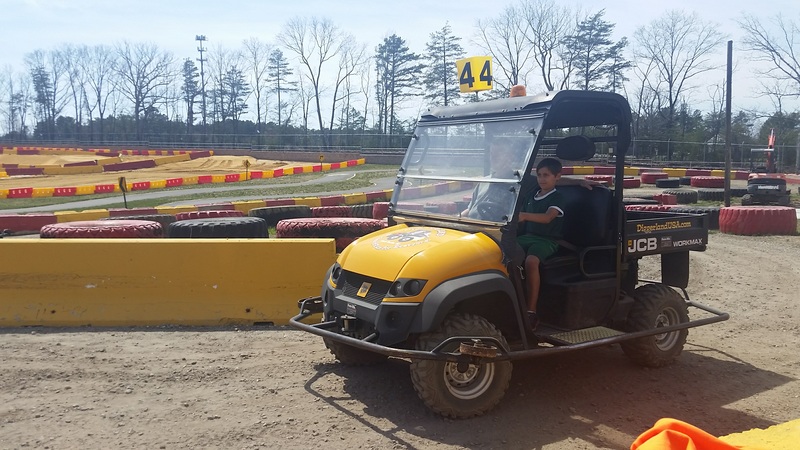 We visited Diggerland last month to experience the fun ourselves and were surprised at the variety of activities guests can enjoy. 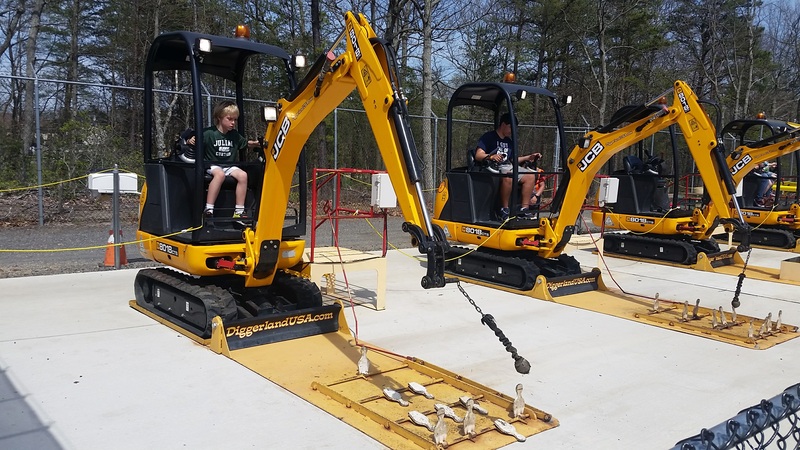 Of course, the big draw is the fact that kids and their families can drive, ride and operate actual machinery including diggers, loaders, and excavators. Some machines are stationary and others you get to drive around, but all the equipment is real. 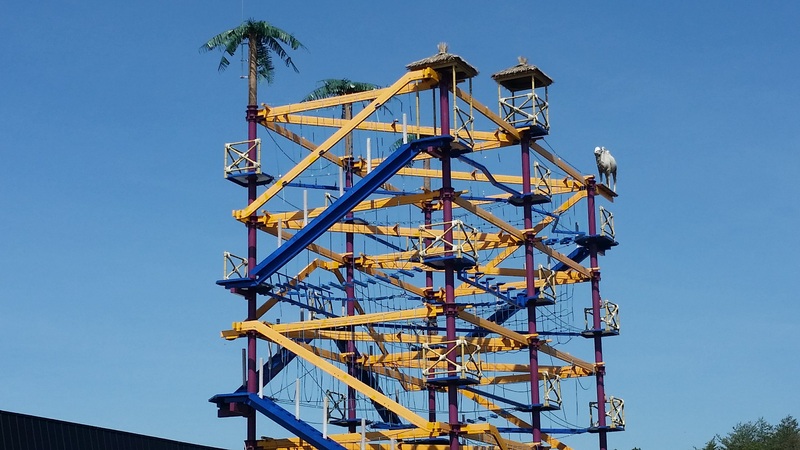 Beyond the equipment, there are construction-themed thrill rides, plus play areas, a climbing wall, a ropes course, and special shows. We spent almost a full day there with our nine-year-old son and still have more to explore on a future visit. Diggerland boasts more than 25 attractions , the bulk of them being real, diesel-powered, full-sized pieces of construction equipment. These machines are “the real deal,” although each has been modified to make them safe for the public, which lets children as small as 36” tall operate the equipment safely with little or no instruction. 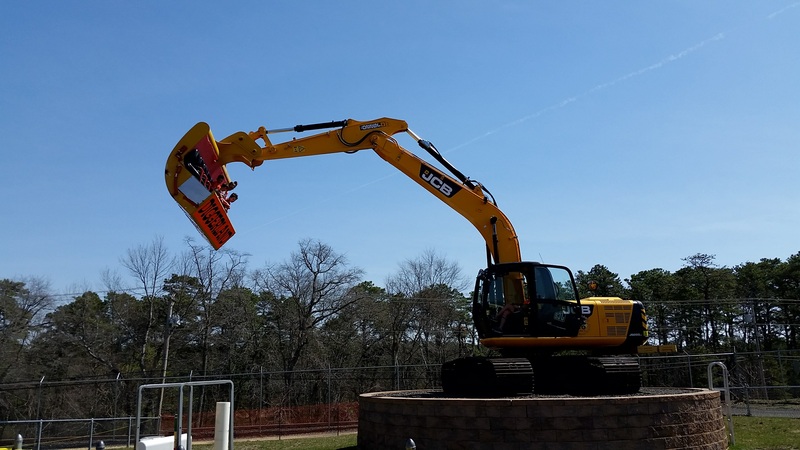 At the park, you can drive full size backhoes, dig giant holes with real excavators, and operate other construction equipment, most of it manufactured by JCB, a heavy-equipment company. Some of the attractions are affixed firmly to the ground and give guests the experience of maneuvering the equipment and meeting a challenge while staying in one place. For example, with the Big Diggers, you can operate a real, 7,092-lb. digger, scooping dirt out of the ground. At the Mini Diggers: Treasure, you are in a mini-excavator, in control of 4,017 pounds of diesel as you move the earth in front of you to search for hidden loot. 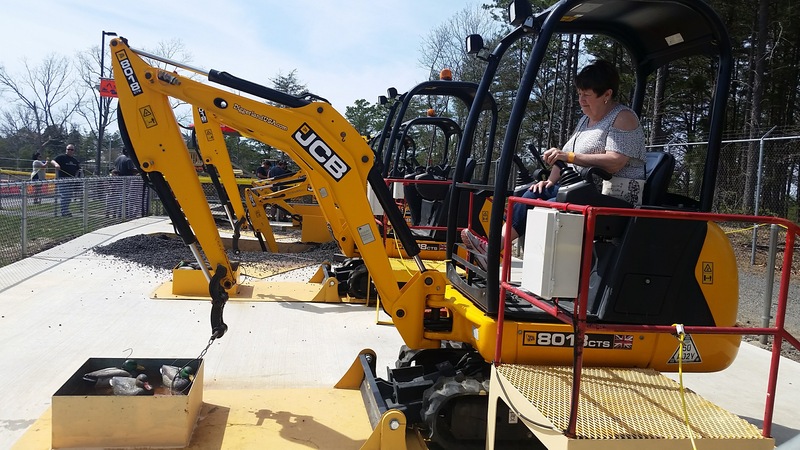 At other nearby Mini Diggers, you sit in the cab and maneuver the arms to try to grab decoy ducks from a small “pond” or knock down pins in a version of bowling. To operate any of these, guests must be a minimum of 42”, although children as young as 36” can be lap riders. We had fun with the duck game, which was more challenging than it appeared! This is a popular attraction and we saw riders of all ages, some with kids, some alone, give it a go. The bigger thrill, though, may be with the vehicles that you can drive around a track. Our son was over the moon with these… how many kids under the age of 10 can say they really have driven a real vehicle? Among the choices are Shake N’ Roll, smaller versions of steam rollers used in highway construction; Skidsteer Loaders; and WorkMax 4X4 all-terrain vehicles (the height miminums for these are 42”-48”). 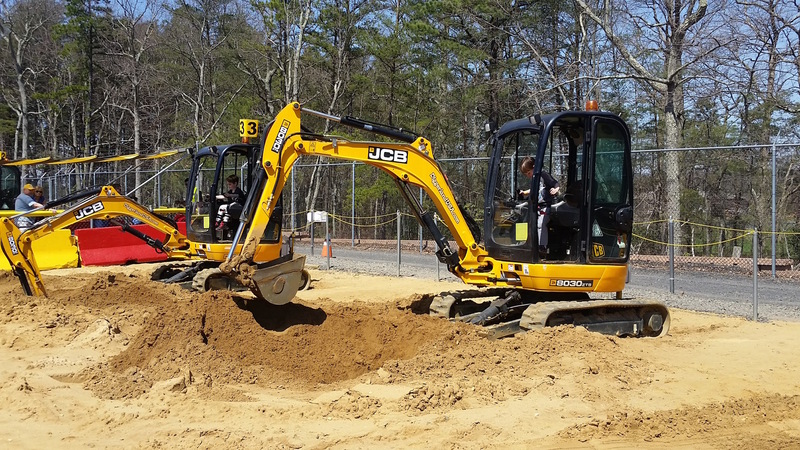 Kids also can enjoy the Backhoe Adventure (36” to ride, 48” to operate) with a Diggerland operator. Bigger kids also can ride on the Tractor Turnpike (36” to ride, 52” to drive); 1,310-lb. Dumper Truck (56” and up to operate); and 8-wheeled all terrain amphibious ARGOs (48” to drive). If you prefer to leave the driving to others, additional rides include short trips on the Excavator Express (like a train, but pulled by a tractor); Operation Battle Truck, an actual 5-ton military transport vehicle; and the Ground Shuttle, a telescopic handler that pushes passengers 25 degrees in all directions while six-and-a-half feet off the ground. And then there are the thrill rides. Diggerland also has a few thrill rides, such as Spin Dizzy. Imagine sitting in the bucket of a specially designed giant excavator as it lifts you off the ground and spins you around. My husband and I chickened out but our son rode this several times and it was his favorite thrill ride. Spin Dizzy isn’t for the faint of heart! This is a scream-inducing ride that spins you around quickly, and when the ride is slowed down, the bucket sways to and fro a bit. 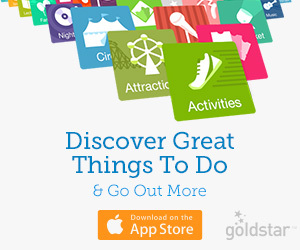 If you’re looking for an adrenaline rush, Spin Dizzy is it! Another exciting ride, albeit a calmer one, is the Sky Shuttle, a JCB 540-170 Telehandler that takes up to 15 park guests up 50 feet into the air. You’ll be lifted and “extended out” and get a great view of all of Diggerland. From high above, you will see all of Diggerland in all directions. All in all, it’s a smooth ride and just scary enough. 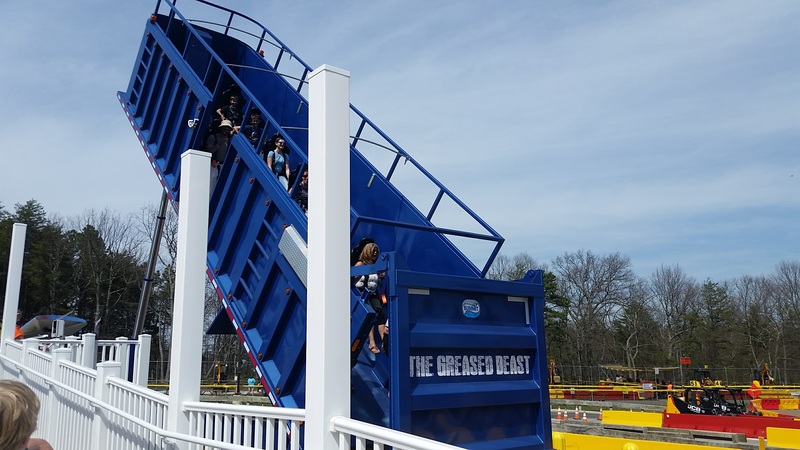 The newest park attraction, The Greased Beast, mimics a cargo dump. Riders sit in one of the 13 seats in the back of a steel demolition trailer going up 34 feet in the air at angle before the door opens and you feel like you’re going to be dumped out the back. Fear not: by the time you start to wonder if you’re going to slide down for real, the truck starts to lower. The minimum height for all these rides is 42”. 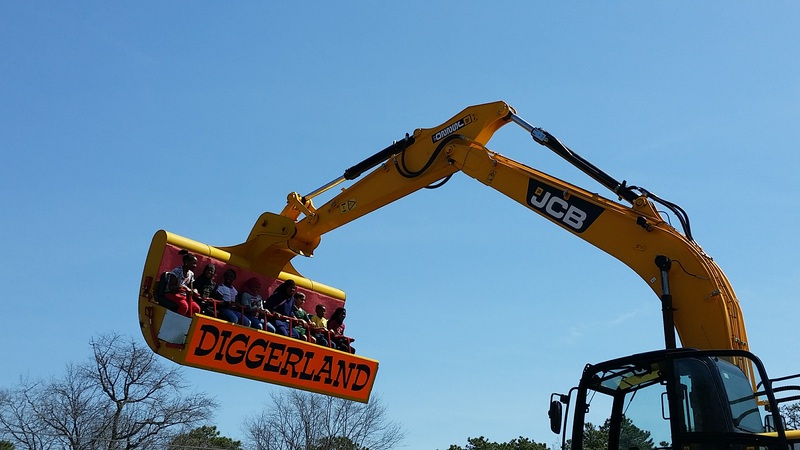 Diggerland’s other attractions include fun the Dig-A-Round, the park’s version of a merry-go-round with mini excavators instead of horses, a 32-foot-tall rock climbing wall, and a challenging four-story tall ropes course that we enjoyed. All these attractions are included in your admission price ($26.95 for guests under 42” tall, $31.95 for 42” tall and over, and free for under 36”; parking is free). 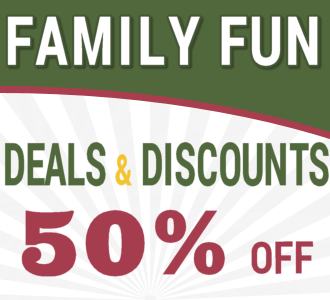 The carousel, rock, wall, and ropes course all have height requirements that won’t work for very young kids, but there are other attractions for them to enjoy, including a barrel train, an arcade, and gem mining (additional fees), plus goats to visit. 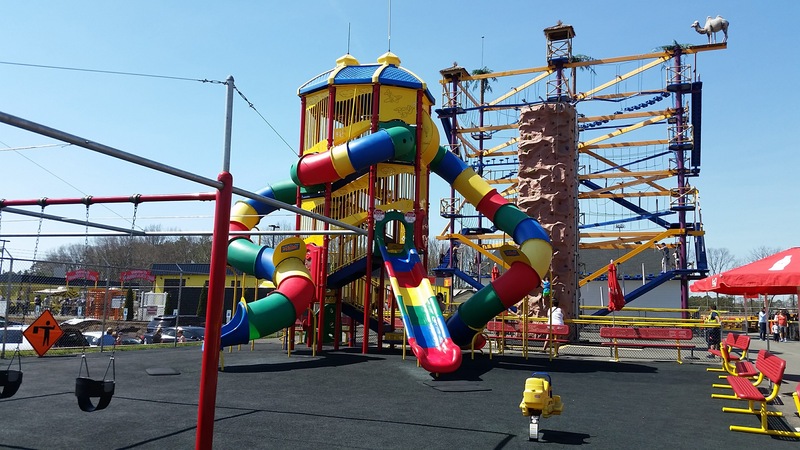 Adjacent to the rock climbing wall and ropes course is a large playground with slides, big tunnel slides, and toddler swings. On select days and times, Diggerland also hosts stunt shows and special events such as car crushing. Adults (age 18 and up) who want to take the excitement up a notch can visit the adjacent Diggerland XL. 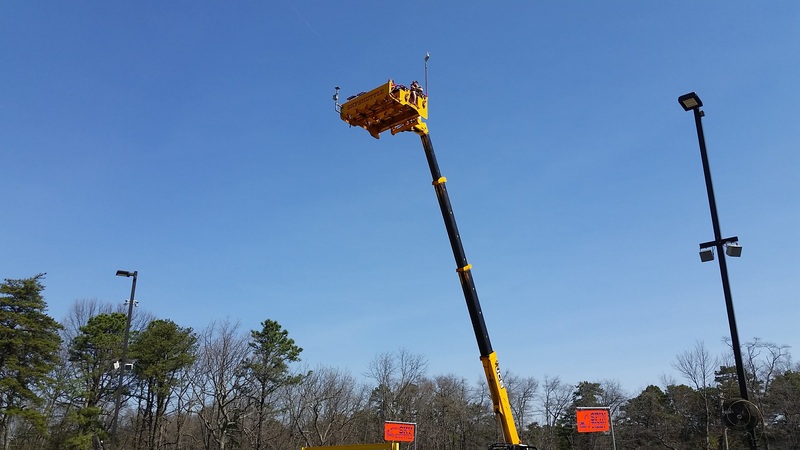 Here they can operate unrestricted, full-size construction equipment with instruction via radio communication. Equipment includes excavators, loaders, and dozers. 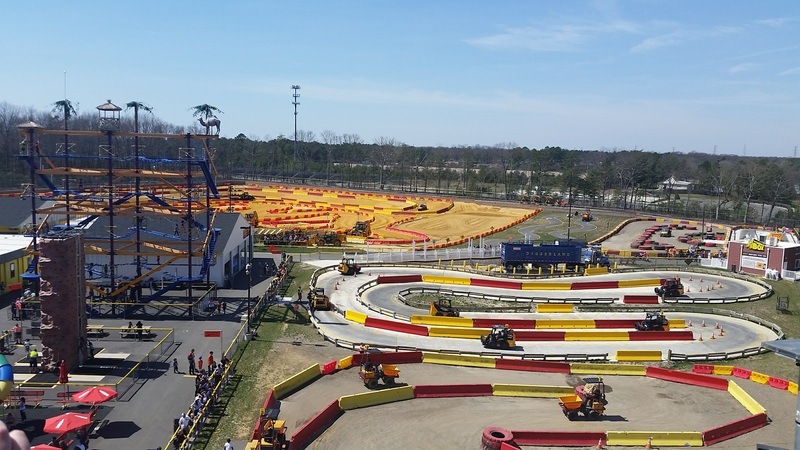 Packages (by reservation only) start at $199 for one hour and include admission to Diggerland USA. You can even upgrade your package and add a car to crush! 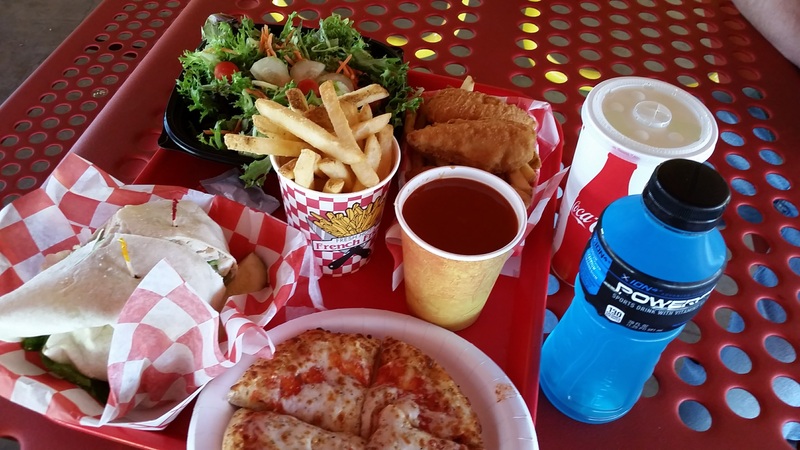 Diggerland has a café and a concession stand, serving hot dogs, sandwiches, pizza, salads, and the like. While we found the café food quality to be good, the portions large, and the prices reasonable, we had to wait a long time, even though there wasn’t much of a line when we arrived. There’s a sign that warns you that the food is cooked to order so it may take some time, but that won’t mean much to kids who are hungry. Since Diggerland doesn’t allow outside food, I suggest either keeping some snacks in the car that you can go out for, or get in the line for the café early. On the plus side, you can enjoy your meal in a very large tented area to get away from the sun, a nice break since there isn’t much shade anywhere else in the park. Diggerland also has a nice shop perfect for fans of trucks and the building trades. Here you can find Diggerland-branded shirts and other merchandise, plus many different construction play sets, toy trucks, plush animals, gifts, hard hats (in yellow or pink), and more. 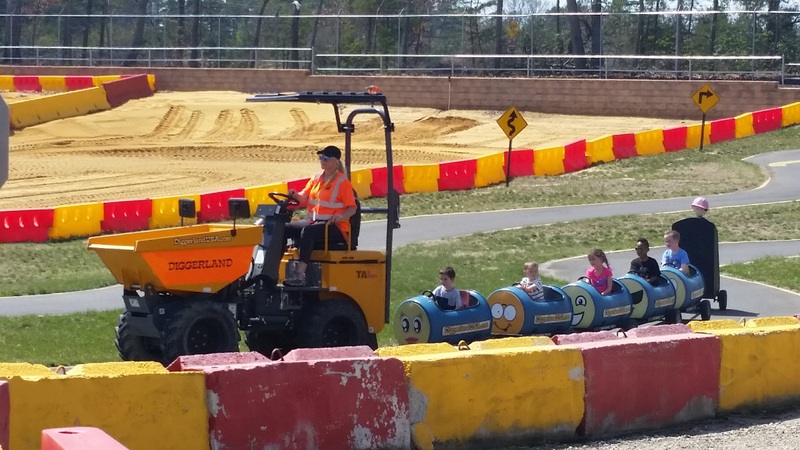 Plan well: Based on our experience and the height requirements for most rides, we think Diggerland is best for ages 5-11 or so; younger riders can still enjoy the park but won’t be able to operate machines as the bigger kids can. Come dressed right: you will need sneakers or similar closed-toe shoes, and should use hats and sunscreen as there are virtually no shaded areas except for the arcade and dining tent. Consider buying an annual pass: At $64.95 per person (or currently on sale for $49.95), an annual pass would pay for itself in two visits or less. 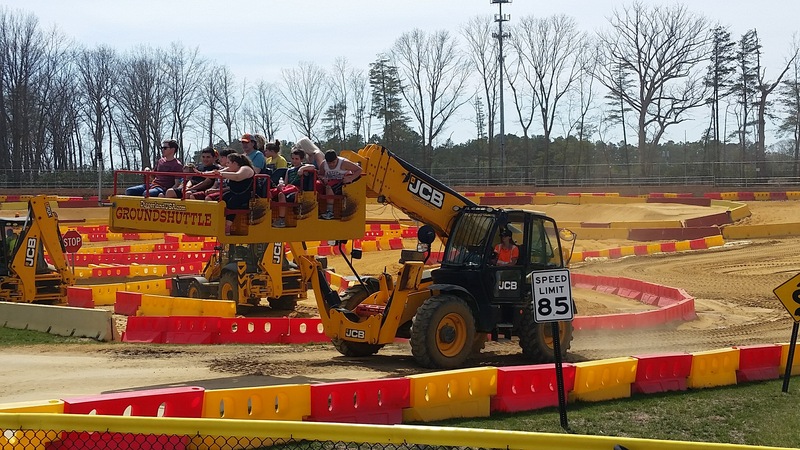 Diggerland is just three hours from the DC area, a comparable distance to other big theme parks in the mid-Atlantic. Plan to spend all day there: there is enough to do and if you visit during a busy day, you may be waiting in line for some of the most popular rides. That said, the park is a good size, not huge, so you absolutely can see all of it in one day. Be there when the park opens: That’s what we did, and we had no wait at all for any rides during the first couple of hours. Schedule enough time for lunch: Get in line early or at least don’t wait until you are starving to eat, since the wait seems longer than usual at most parks. Visit Sahara Sam’s: If you’re in the area for more than a day, consider a visit to Sahara Sam’s just down the street. 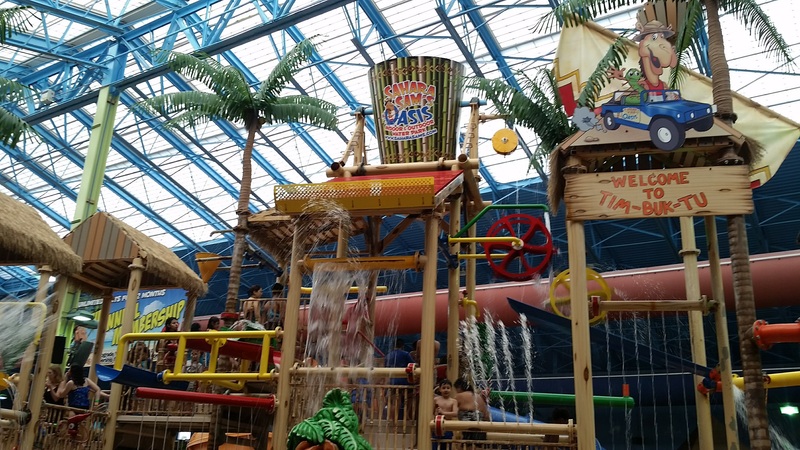 This indoor waterpark (separate admission) is owned by the same company that runs Diggerland. Have you been to Diggerland? Share your experiences with fellow readers via the comments below! Disclosure: My family received complimentary admission to Diggerland to facilitate this review. This article is my original writing and the opinions expressed in this review are strictly my own. 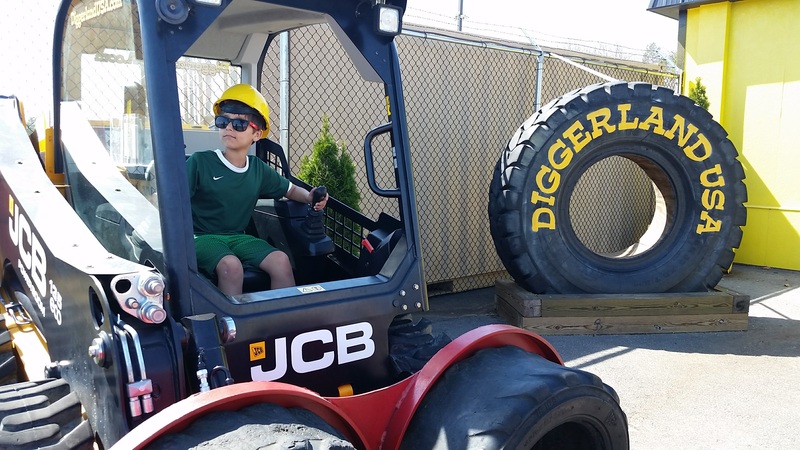 Share the post "Diggerland: a day of construction-themed family fun"
Boys love birthday parties, trucks, and dirt but maybe not in that order! 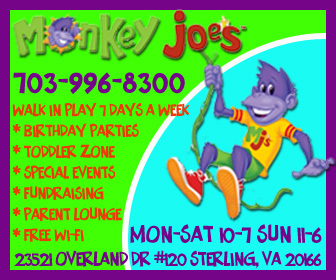 The construction-themed birthday party for boys has been one of our most popular party ideas.